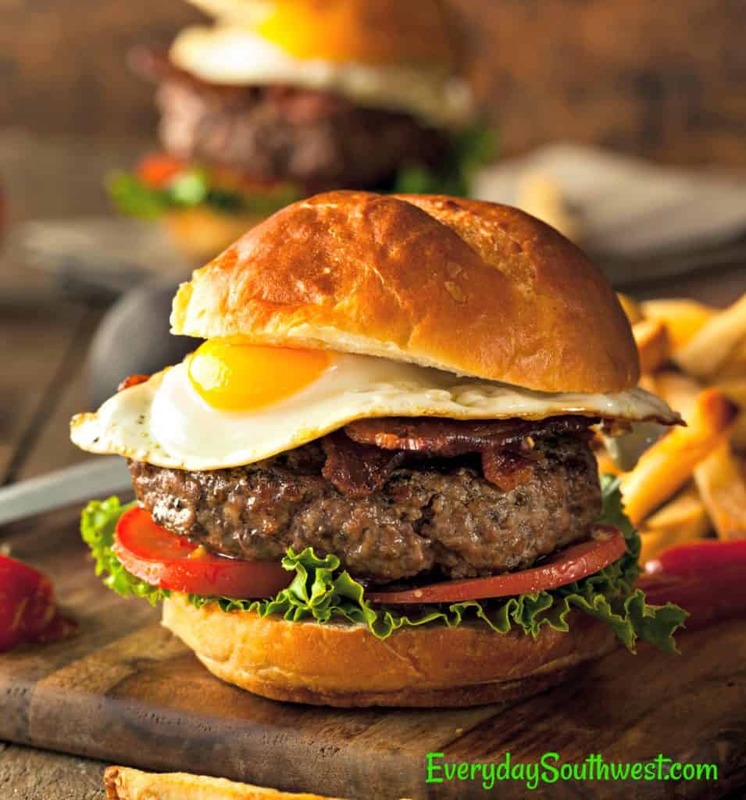 M#This Gourmet Burger Recipe blends flavors from the Old Mexico with modern California freshness. Mexican Chilaquiles on a bun! Healthy avocado, a perfect egg, Mexican chorizo and fresh pico de gallo piled on a toasted brioche bun give you the MexiCali Burger Breakdown. This over the top MexiCali Gourmet Burger Recipe is part of a the #BurgerMonth Ultimate Burger Grill Giveaway hosted by GirlCarnivore and her amazing sponsors. But, the MexiCali Burger deliciousness is all my own. 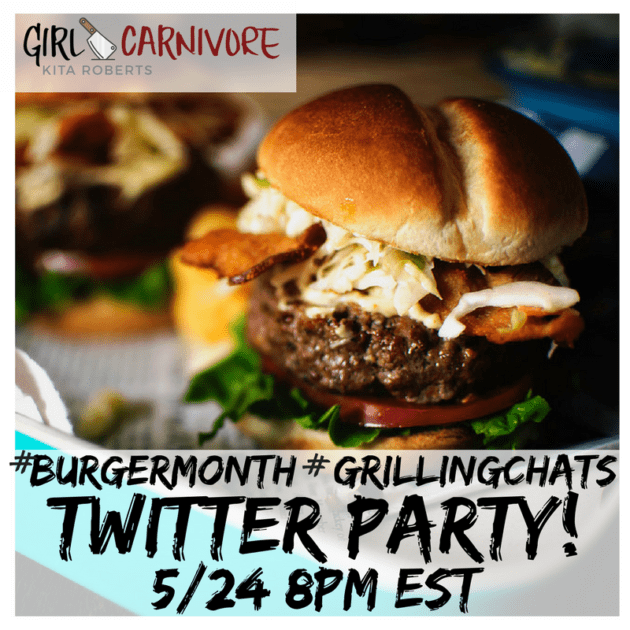 I’m so excited to be part of Girl Carnivore’s annual Burger Month Giveaway again this year. It was an thrill to have my Ultimate Green Chile Bacon Burger included in the event last year BUT, to be included two years in a row? And have my burger lead off the month long event? Well, it’s honor. Just sayin’. How do you create a burger to match the all-time favorite Ultimate Green Chile Bacon Burger, you might ask? It was really hard. I’m not going to lie. I had to go back to my Southwest roots and mix amazing Mexican flavors with the modern freshness of Southern California. Then, BAM! The MexiCali Burger Breakdown was born. Why name my gourmet burger recipe master piece after MexiCali? That little town on the map somewhere in the dusty desert between Yuma and San Diego on the other side of the border? Because, that little road sign to MexiCali has always been the signal that it is time to get excited. The signal that we are getting close to our favorite road trip destination (San Diego) and our favorite breakfast joint on the whole darn planet. I am obsessed with Brockton Villa Restaurant’s Chilaquiles. Their chilaquiles are a delicious pile of corn chips simmered in spicy red chile sauce that is topped with layers of chorizo, steam scrambled eggs, avocado and pico de gallo. The final touch is a dollup of sour cream is spooned on top. They haunt my day dreams. I just had to turn those flavors into this delicious, over the top gourmet burger recipe. Now, I can eat them any day—not just on a road trip. Someday, I will tell you about our road trip “break down adventure” that had us stuck on the side of the steep, winding road to MexiCali. 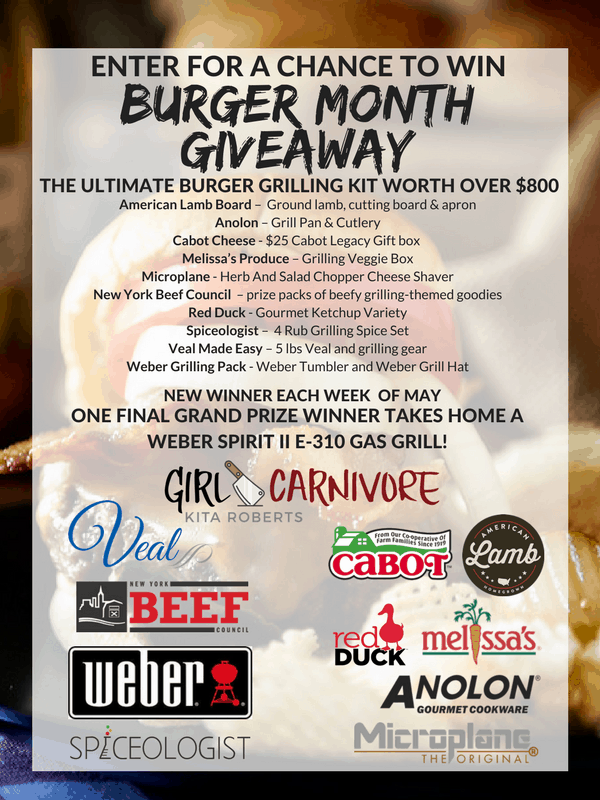 For now, let me share Girl Carnivore’s AWESOME Burger Month 2018 Giveaway! 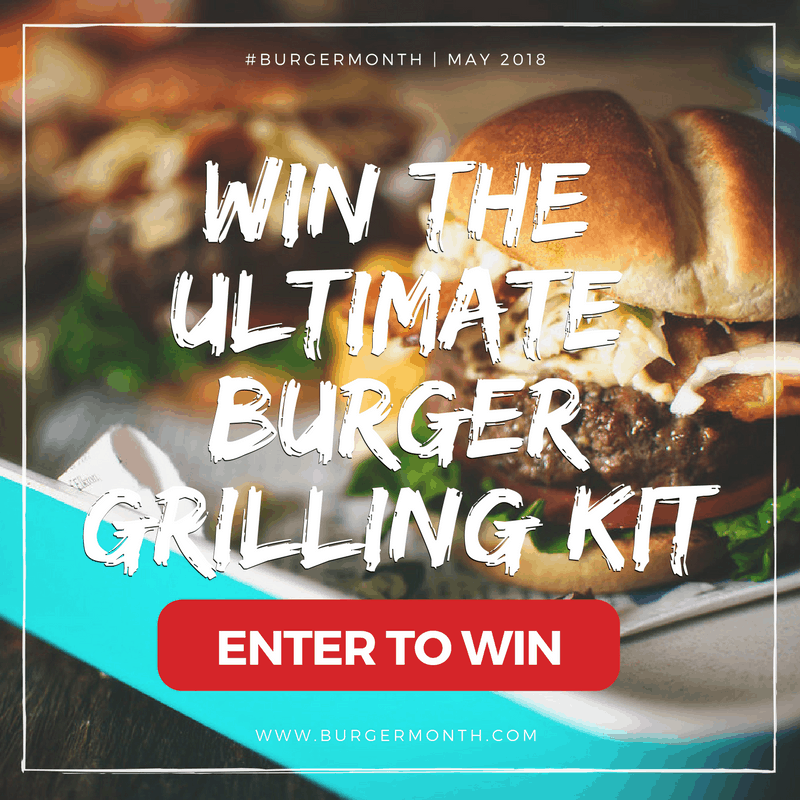 Enter to win using the Rafflecopter at the bottom of this post or visit #BurgerMonth’s Official Page to enter. Enter to win this Gift Box filled with everything you will need to create the best burgers ever in your own back yard. 1 winner drawn each week for every week of burger month! All weekly winners are entered in the Grand Prize drawing for a chance to win a Weber Spirit II E-310 gas grill! American Lamb Board, Anolon, Cabot Cheese, Melissa’s Produce, Microplane, New York Beef Council, Red Duck, Spiceologist, Veal Made Easy, and Weber Grills. For the chance to get together and share our newest burger creations. 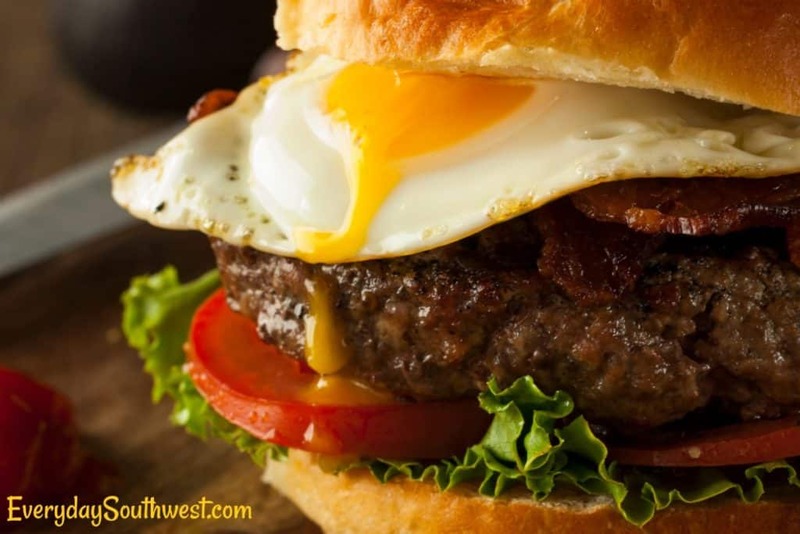 Print the MexiCali Gourmet Burger Recipe or Pin it for later. You can follow me on Pinterest for more great burger recipes. Have you ever made an “out of the box” burger? I’d love to hear about it. You can leave a comment here on this post or you can always find me on Everyday Southwest’s Facebook Page. I love hearing from you! All the flavors of Old Mexico layered with the fresh veggies of Southern California to make an over the top gourmet burger recipe. Heat red chile or enchilada sauce and simmer. Stir in enough of the crushed tortilla chips to thicken the sauce to the consistency of mayonnaise. Chill. Cook the bacon to crispy. Mix the ground beef and chorizo together. Season with salt and pepper. Form mixture into patties, cover with plastic wrap and chill until ready to grill. Toss sliced tomatoes, sliced onion, sliced chile and cilantro together with the lime juice. Season with salt and pepper. Set aside. Grill the hamburger patties. The patties should be cooked through, not medium rare because the chorizo needs to be cooked through and not raw. Cook the eggs to sunny-side up. Assemble the burgers by spreading the red chile sauce on the bottom bun. Top with a layer of lettuce, slice of tomato, onion and serrano or jalapeno. Place a burger on the tomato stack. Add a spoonful of guacamole and crispy bacon. Top with a sunny-side up egg and top bun. Beautiful photos ! Beautiful dish ! Thank you ! This is one freakin’ flavorful burger!!! My mouth is watering just by looking at your photos! Oh man that photo with the bit of yolk drizzle. I want to dive right in! Thus burger is screaming to me. It looks absolutely delicious. This fabulous Mexicali burger is the stuff of hamburger dreams! It’s layered with all the delightful ingredients and flavors my entire family loves. Mmmm…I just want to bite down on one of these delicious beauties right now! This is just about the best burger EVER. Thank you. In a word – WOW! 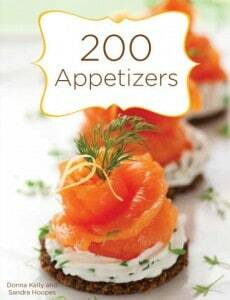 This recipe packs so much flavor. It was enjoyed by everyone in my family and they’ve asked me several times to make it again.